There is no possible way for neonics and insect life to coexist. Particularly when the insects actually travel. Yet we spoke up here in 2007. There was already ample evidence of the source of the problem not least the negative evidence of application and related local collapse. Yet here we are a full eight years later with a burgeoning file of confirmation and still denial and no action. I have little doubt that the companies will all be ultimately forced into chapter eleven to escape the liabilities they are accumulating here. Worse this is all disclosing the bribe to play culture now dominant at the related agencies worldwide. There is presently zero reason for not shutting this all down. Do we have to cause a sudden upswing in liver cancer to make this point? 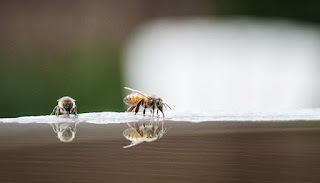 I suspect that is a real risk here although it usually takes thirty years to become apparent..
David Hackenberg, who first announced the phenomenon now known as 'Colony Collapse Disorder' (CCD) back in late 2006, has lost 90 percent of his bees. Again. "We've lost our bees before, but it's never been this bad," says 43-year-old Davey Hackenberg who now runs Buffy Bee, his father's East Coast operation. The father-and-son team went from 1700 hives at the beginning of winter to a little less than 300. And for the first time in years, they're not driving cross-country to the Central Valley to pollinate almonds. They don't have enough bees. Many commercial beekeepers depend on the lucrative almonds – a 6.5 billion dollar crop that spans 500 miles—to stay in business. Hackenberg and Adee continue to try to save their bees. They, along with other beekeepers, farmers, and sustainable agriculture and conservation groups, such as Center for Food Safety (CFS), filed a lawsuit in the early part of January 2016, challenging the Environmental Protection Agency's (EPA) inadequate regulation of the neonicotinoid insecticide seed coatings used on dozens of crops. "As a beekeeper for over 50 years, I have lost more colonies of honey bees in the last 10 years from the after-effects of neonic seed coatings than all others causes over the first 40 plus years of my beekeeping operation," says Hackenberg. The lawsuit argues that the EPA has illegally allowed widespread environmental contamination to occur from the use of pesticide-coated seeds, without requiring the seeds to be registered under the Federal Insecticide, Fungicide, and Rodenticide Act (FIFRA). "Because the coated seeds are not registered, there are no enforceable labels on the seed bags and no adequate assessments of serious ongoing environmental harm," explains Abigail Seiler, CFS Media and Communications Manager. The EPA has essentially skirted the law and not registered these coated seeds thanks to a specific exemption, called "treated article," which allows the EPA to eliminate "all provisions of FIFRA." This in turn relieves the EPA of accountability and their duty to require registration of neonicotinoid-coated seeds. "Because of a major regulatory loophole, neonicotinoid seed coatings are being used without adequate safety testing, proper data gathering, or necessary product labeling," adds Larissa Walker, CFS Pollinator Program Director. The truth is that beekeepers cannot afford the three to five years it will continue to take if the EPA chooses to 'drag out' the treated article exemption in courts at the request of the pesticide industry. They need them to properly regulate these pesticides today. "People need pollinated food; somebody must stand up and say no to unregulated killing of pollinators," says Jeff Anderson, beekeeper and lead plaintiff in the case. CCD is not a random & undefined "disorder" but a direct result of these poisons that have been wreaking havoc on our environment for already more than two decades. And yet, manufacturers like Bayer and Syngenta, along with the EPA, are still denying their effects, despite a growing body of science and empirical observations from beekeepers around the world. These poisons can stay in our soil for up to 18 years and their metabolites are even more dangerous than the parent compounds. They kill worms and other microorganisms and compromise our soil's overall health. EPA's actions surrounding neonicotinoid seed coatings have led to intensifying and destructive consequences, says lawsuit and CFS attorney Peter T. Jenkins. And it's not like there are many to choose from. Four of the largest seed companies, one of them being Monsanto, control nearly 60 percent of the global patented seed market, according to Mary Hendrickson of the University of Missouri. This fact constrains farmers' choices. "Meanwhile, seed treated companies include incentives to buy coated seed in the form of insurance: If their crop fails, the farmer will get a 100 percent rebate. Without the coatings, the rebate is only 50 to 75 percent," adds the same article. "That's one of the reasons we throw everything on the seed," Matt Hughes, a farmer, told Progressive Farmer." Treated seeds are so popular and yet their cost-effectiveness has been challenged in recent years, with numerous studies indicating that their near ubiquitous use is unnecessary — and making EPA's disregard of their risks all the more harmful. "EPA can't bury its head in the sand any longer. Seed coatings are just the latest delivery device of pesticide corporations that pose a threat to pollinators and the food system," says Marcia Ishii- Eiteman, senior scientist at Pesticide Action Network. "Given widespread use and persistence of these bee-harming pesticides, it's time for EPA to fully and swiftly evaluate the impacts of seed coatings — and prevent future harm."